GOING FORWARD, ALL OF US STAKEHOLDERS in Nigerian sport (managers, coaches, athletes, marketers, media, the fans, etcetera) must decide quickly what we want to do with Nigeria's minister of sport, Mr. Solomon Dalung: Give him more stick or hand him the carrot. 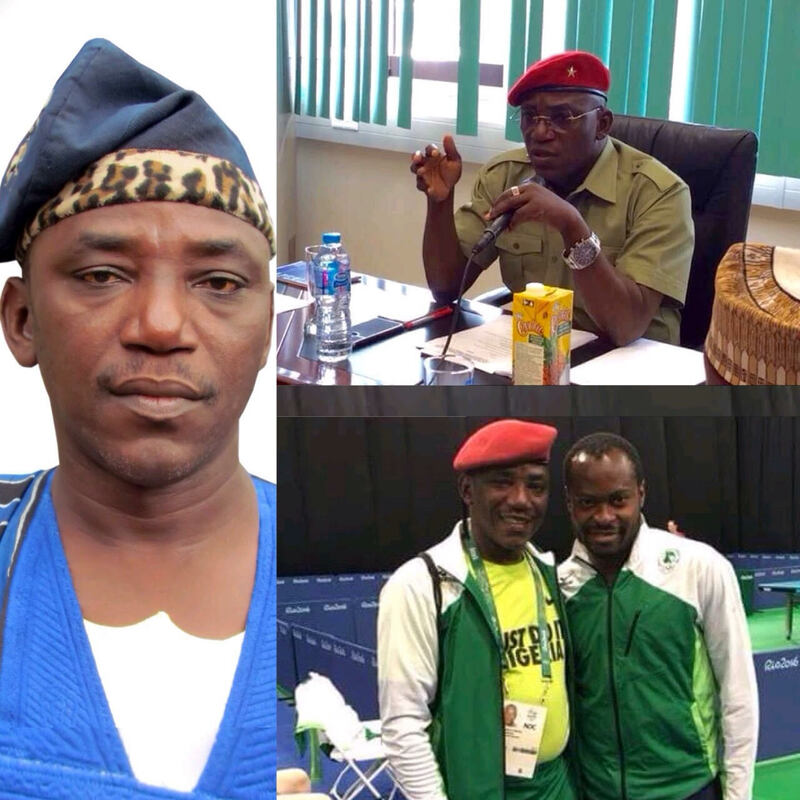 Clearly, Dalung deserves some stick(s) for the manner he has superintended over our sport sector and he has been getting a lot of it particularly lately, since the end of the 2016 Olympics Games in Rio where our ill-prepared contingent could only win a face-saving bronze medal in the football event. With Dalung already a subject of public derision both in the mainstream and social media, the easiest thing for me in this article is to join the bandwagon in the public flogging of the minister. But I paused to ask myself: what would that achieve? The outcome of my introspection is that, rather than give the minister additional stick, I'm advocating that we hand him the carrot for reasons that I will advance presently. I'm willing to wager that engaging with the minister (the carrot option) will be more productive and beneficial to Nigerian sport in the long run than name-calling, social media mobbing and ineffective street-protests demanding his removal from office (the stick option). Essentially, I am suggesting that we look at the bright side of Dalung. But, first, let me state my position on some of the minister's policies and actions since he was appointed by President Muhammadu Buhari in November 2015 while this column was on a prolonged break. 1. I stand with the majority of Nigerians in condemning Dalung's innocuous role in reigniting the power tussle in the Nigeria Football Federation (NFF) when things seemed to have simmered in the battle between Amaju Pinnick and Chris Giwa for the NFF leadership. Dalung's intrusion has only emboldened Giwa to become more rebellious, resulting in escalating disruptions to the game, the most recent of which was a purported court order suspending the Nigeria Professional Football League. 2. I stand with the majority of Nigerians in criticizing Dalung's behaviour towards coach Samson Siasia and the U23 Olympic football team in the run up to the Rio Games, practically turning his back on the team during their preparations in Atlanta, USA and publicly disavowing the coach, only to make an about face when the team started performing well in Brazil. 3. I totally, totally agree with those who say that Dalung should take the rap for the situation that forced our athletes to appear in track suits at the opening ceremony in Rio, only for their ceremonial uniforms to arrive three days to the end of Olympics! What a scandal that was! In fact, that for me was the biggest embarrassment suffered by Nigeria in Brazil. It was a national shame. The foregoing three instances, among others, highlight why Dalung is unpopular with most stakeholders in sport and why he's fully deserving of the stick that he's been getting. In an ideal world, even the third episode alone would have been enough to get Dalung and/or other responsible officials the sack from their posts, but this is Nigeria where public officials are hardly held accountable for such "minor" irritations. 1. Dalung is NOT responsible for our overall failure at the 2016 Olympics. He was only appointed in November 2015, less than a year to the games, and he couldn't have performed any magic with our athletes within such a short time. Surely, he could have handled the games management, logistics and athletes welfare much better, but he certainly wasn't responsible for our failure to win medals. 2. Dalung apparently realized the deficiency in the Nigerian sports management structure when he set up a 13-member Sports Reform Committee led by veteran tennis player and coach Godwin Kienka in April 2016, just barely five months into his tenure. That committee was not an after-thought. It was set up before we went for the Olympics in Rio, so we have to accept that Dalung saw the need to reform our sport structure even before the failure in Brazil. The committee finally submitted its report and recommendations last week after requesting for a "reasonable extension" of its original July 14 deadline. Apart from Kienka who I know for his thoroughness and commitment, other members of the committee such as Segun Odegbami (football), Sam Ahmedu (basketball) and Mary Onyali (athletics) are credible people with deep knowledge and insight about what Nigerian sport needs to do to rise again. There must be something promising coming from this committee. 3. Dalung has publicly admitted that the scrapping of the National Sports Commission (NSC) during President Buhari's merger of Federal Ministries was a mistake and that the commission is needed to play a pivotal role in our sports development. 4. Dalung has decided to declare a State of Emergency in Nigerian sport in order to arrest our speedy and dangerous decline and he has promised to review and implement the recommendations of the Godwin Kienka Committee in the process. 1. What are the full contents and recommendations of the Sports Reform Committee report? 2. Who are the members of the review panel that he has promised to set up, what are their terms of reference, when will they start the review and when will they submit the final paper to be gazzetted? 3. What specific actions and steps is the minister taking in his declaration of a State of Emergency in Nigerian sport? What are the time lines for execution and what roles for the stakeholders in the sport sector? 4. Most importantly for me, what steps is he going to take to bring back the National Sports Commission into our sports management structure since he has admitted, and I agree with him, that it was a mistake by this government to scrap it in the first place? Depending on the minister's responses to my posers, I definitely will have follow-up questions for him. But let's start with getting answers to the foregoing. I am particularly interested in resuscitating the NSC, this time as a fully independent institution, because I think that is the best way we can have sports technocrats and trained professionals fully taking over the management of Nigerian sport. We have seen how the politicization of the headship of the ministry of sport has retarded our growth as different ministers with or without knowledge in sport get appointed by successive governments. And before they even settle down, they're on the way out. I envisage a brand new NSC that is independent of the ministry of sport and headed by a Director-General who will run the commission as the Chief Executive Officer (CEO). The sport minister will not double as chairman of the NSC as was the case before the NSC was scrapped. The sport minister will continue to be a political appointee while the DG of the NSC will be an expert in sport and management. Their roles will be separated and clearly defined. The minister will oversee government policies while the DG will be responsible for implementation and performance. The DG's position will have to be advertised and filled by tested technocrats whose appointment will be strictly on merit, with a tenure of four years (for an Olympic Games cycle), renewable based on performance and results achieved by coaches and athletes under his care. Such an arrangement will engender long term planning, proper goal-setting and improved stability in our policy formulation and management which are the basic ingredients that we need to prepare properly for events such as the Olympic Games and other international competitions. The present arrangement where politician-sport ministers come and go at short notice have had grave consequences for continuity in policy formulation and execution. The resultant mismanagement is the main reason for our retrogression. Dalung is a lawyer by training. If he is able to push the NSC resuscitation agenda through by getting presidential approval, and also securing legislative support and passage, he would have done Nigerian sport a big favour. Thereafter, I would advocate that the headship of the new NSC, unlike the old, should not be restricted to sport ministry staff any more, but thrown wide open to all Nigerians (including civil servants and private sector technocrats) who feel they have the ideas and the capacity to properly run the commission in terms of visioning, branding, funding, sponsorships, elite athlete management, talent discovery and grassroots development, competitive participation/results and other key indices of assessment. A good example is what is happening with the Nigeria Football Professional League (NPFL) where non-sport ministry administrators have turned the domestic league around in the last few years. To conclude, I challenge my colleagues in the media, particularly the Sports Editors' Guild, sport programme producers and social media influencers, to lead the stakeholders engagement with Dalung by monitoring all that he has promised to do concerning the Sports Reform Committee report as well as his plan for a state of emergency in Nigerian sport. Like the story of the missing Chibok Girls, let us keep this reform matter on the front burner of sport discuss. Let us hold the sport minister accountable; let us engage him to deliver on his promise to restructure sport administration in Nigeria; and let us make our own contribution to that process. This is what I advocate. However, if we think that it is enough or populist to criticize the minister on radio and television, lambast him in newspaper columns and editorials, and issue press statements condemning him for our poor outing at the Rio Olympics, let's get ready to do all of that all over again in four years time after we might have failed again at the 2020 Tokyo Olympics in Japan. But if the past is anything to go by, we can be sure that Solomon Dalung would be gone from the Nigerian sport scene by then, leaving us the real stakeholders lamenting another Olympic failure and heaping the blame on the next politician-sport minister. Should we give Dalung more stick, or hand him the carrot? The choice is for individuals and groups in the Nigerian sport fraternity to make. Clearly, I am in favour of the carrot. NEXT WEEK: How Gernot can "Rohr-mble" Super Eagles to Russia 2018 FIFA World Cup. Thank you my friend Mumini Alao,you see,i don't blame Mr Dalung because his appointment as a minister of sports was not by merit but partisan,so he is representing his zone for the NATIONAL CAKE,again am not surprised that he is siding and supporting a man who has vowed to bring our football game to zero level with his disruption here and there,am talking about no other person but Giwa,but no condition they say is permanent.